[toc]Lung cancer is one of the most common cancers around the world. It is more common in individuals who smoke cigarette. However, it can affect anybody. The common signs of lung cancer are chronic cough intractable to anti-cough medications. Streaks of blood in sputum are another important sign of lung cancer. Other signs include wheezing, difficulty with breathing, and mild to moderate chest pain. Signs of lung cancer depend on location of tumor. Cough related to lung cancer may resemble viral cough in the initial stages. However, let us try to understand more about signs of lung cancer. As stated above, patients suffering from lung cancer experience chronic cough. The cough may abate in intensity with medications. However, it is recurrent in nature due to the development of cancer in the lungs. The cough may increase in frequency and intensity during nighttime. In its early stages, the cough is often dry in nature. However, sputum production and blood can be seen over a period of time. 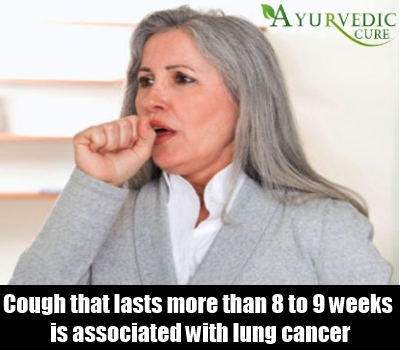 Cough that lasts more than 8 to 9 weeks is associated with diseases like lung cancer. Shortness of breath can be associated with other diseases as well. However, difficulty breathing with persistent cough is one of the primary indications of lung cancer. This is an indirect consequence of degenerative changes or tumor in the lung. Sputum production can hinder the ability to breathe by narrowing airway. Lung cancer can affect blood vessels as well. This can result in significant shortness of breath. Shortness of breath can be associated with intermittent wheezing and chest pressure. These signs often appear in a cluster. Abnormal changes in the body due to lung cancer can result in weakness. Weakness is normally experienced in the later stages of lung cancer. Feeling tired and weak with the signs mentioned above is common. This is a consequence of lung cancer requiring your body’s defense mechanism to work harder. Weakness can also be associated with malignant changes or metastasis. Weakness with lung cancer can be a result of weight loss. Lung cancer affecting spine can lead to weakness of the lower extremities. It can also cause difficulty with walking. In the initial stages of lung cancer, chest pain may not be apparent. However, in the later stages, persistent cough and malignant changes can lead to chest pain. Pain can be mild to moderate in intensity. The degree of pain associated with chest pain depends on the progression of disease symptoms. Chest pain can be a direct consequence of tired chest muscles due to constant coughing. Chest pain associated with lung cancer is often constant. Shoulder pain with lung cancer can be a result of tumor pressuring phrenic nerve. Difficulty with swallowing is medically known as “dysphagia.” This can be a result of metastasis of lung cancer to the esophagus. However, pain associated with other symptoms of lung cancer can also lead to difficulty with swallowing food. Hoarseness of voice can also be associated with dysphasia. This is a consequence of lung cancer affecting vocal cords. 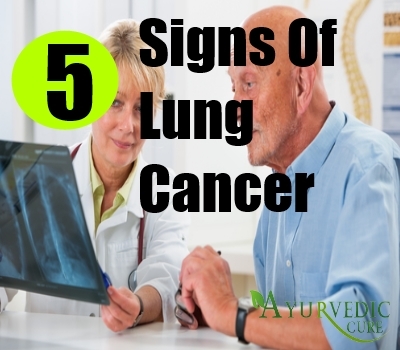 These signs may wax and wane in intensity during the initial stages of lung cancer. However, they become persistent with progression of lung cancer. A great majority of lung cancers are carcinomatous in nature. Initially, symptoms may resemble common cough. However, it is wise to get a scan and confirm the presence or absence of a cancer lesion.